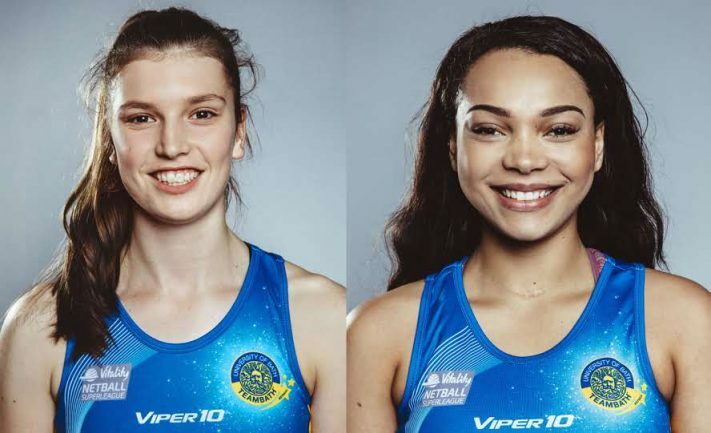 England Netball Futures duo Sophie Drakeford-Lewis and Paige Reed are among an exciting group of young stars who will represent Team Bath Netball at the national NPL (Netball Performance League) end-of-season tournament in Nottingham later this month. The duo are joined by fellow University of Bath sporting scholars and Vitality Superleague players Imogen Allison and Tash Pavelin in a strong Blue & Gold U21 squad for the event, taking place from July 25-29. Abi Robson, who made her Superleague debut this year, and Chartie Curtis, captain of England U19s on their summer tour of Australia, are also in the squad along with Elisha New, Anya Le Monnier, Kirsty Harris, Hannah Passmore and Hannah Blackman. Jess Thirlby is Head Coach and will be assisted by Nikki Lloyd, while Tracey Phillips is Team Manager. Both Drakeford-Lewis and Reed have been selected for the England Roses Futures development programme, while fellow Blue and Gold stars Kadeen Corbin and Layla Guscoth are in the senior England Roses squad for a 2018-19 season that concludes with the Netball World Cup in Liverpool. Team Bath U21s have been drawn against Loughborough Lighnting, Manchester Thunder and Surrey Storm in Pool A, while Wasps, Severn Stars, benecosMavericks and Team Northumbria are in the other group. The U19 competition will see Team Bath line up against Mavericks, Wasps, Storm and London Pulse in Group D. Representing the Blue & Gold are Georgia Jenkins, Emma Payne, Hannah Barnes, Charlie Plumridge, Millie Pearce, Lizzie McGechie, Maddie Durham, Immy Stringer, Jade Peckham, Maya Meredith, Annie O’Rourke and Rachael Fee. Head Coach is Leanne Lewis, Emma Isaac is her assistant and Team Manager is Vicky Carnall. Team Bath U17s will be coached by David White, assisted by Academy Head Coach Lois Rideout, and Nicky Savill is Team Manager. Georgie Ford, Anna Brophy, Mia Regan, Isla May, Emily Becconsall, Meg Connabeare, Liv Mitchell, Sophie Ewin, Molly Hole, Rosie Barlett, Ella Warner and Sophie Orchard are in a Blue & Gold squad that will face Surrey Storm, Team Northumbria, Wales, Wasps and Yorkshire in their group. All of the squads will be supported by physio Rhianon Stidever and performance analyst Pippa Baldrey during the tournament. For more information about the Team Bath Netball Futures Programme and how it is developing the next generation of talented players, visit netball.teambath.com/futures-pathway.